Autonomous cars have been hailed as the next leap for mankind in automotive transportation and infrastructure, offering not only advancements in private and public transport, but addressing difficulties in health infrastructure, emissions, road collisions, and government overheads on traffic and law enforcement. But whose future do autonomous cars belong to, who will the beneficiaries be, and what negative affects will it have on our environment and transport industry? In discussion with TED’s head curator Chris Anderson in 2017 Elon Musk, CEO of Tesla said ‘I’m just trying to think about the future and not be sad.’1 Part of this future Musk is helping to build involves the eradication of human driven transportation and the complete integration of fully autonomous vehicles (AV’s henceforth) into society. Along with Google, Keolis, Uber and Bosch, Tesla is one of countless technology and automotive companies flooding billions of dollars into producing the first fully autonomous vehicles. 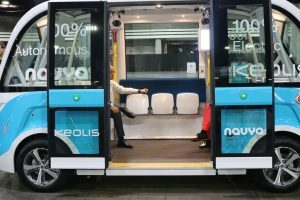 Companies such as EasyMile and Mercedes-Benz have begun piloting what some are calling the ‘Future Bus’, AV’s hoping to replace not only man operated public transport, but to combine consumer and commuter into one entity. While this emergent technology is promising to help eradicate problems such as fatal road collisions, increase vehicle sustainability and reduce emissions, they may also eradicate an entire way of life and radically change our human environment. AV’s run off a complex array of sensor and data fusions, using cameras, radar, lidar, big data and GPS localisation. These vehicles will use not only GPS mapping but live data from both the cars and the passengers to generate ‘state of the world’ maps i.e maps which react to real time changes such as road closures, collisions, pedestrians, traffic and weather, ensuring faster and more precise travel times. The combination of these technologies are also meant to ease the passenger into the idea that they are being piloted driver free, instead the ‘driver would now be the algorithm’ 2 that is constantly being fed up to date information. The concept of a car or public transport being self driven usually whips up a frenzy involving pedestrian safety and legal liability, yet a recent survey conducted by PwC found that 66% of respondents thought that AV’s were ‘probably smarter than the average human driver.’ 3 However, what happens to this environment when you remove the driver? In terms of overhead, driverless cars have massive benefits to government and public transport authorities; buses could run 24/7, fewer drunk drivers, autonomous cars won’t unionise (we hope) and fewer ‘man hours’ to cover. Yet, when you consider what writers such as Carlos Barreneche note about living urban environments, by eradicating human control over these social environments we are tampering with the roles of power, extracting it from the human world, and instead creating ‘data-intensive environments’ whereby ‘information is becoming a vector shaping urban places’ (Barreneche, 332). 8 As Barreneche describes ‘we are now dealing with places in the form of a network of relations and connections’ (Thielmann 2010) woven by the socio-spatial behaviour and lifestyle characteristics of individuals’ 9 instead of the community or world as a whole (Barreneche, 338). With the move towards AV’s being rolled out globally by 2020, huge multinational corporations like McDonald’s and Amazon are already looking into the possibility of offering free public transport – as long as you are their consumer. Here we could have what Foucault refers to as a serious ‘environmental type of intervention’ (2008, 172) 10, where the power of the AV reshapes and remaps the routes of every day life and traffic based on consumerism. Jennifer Garby’s writes in ‘Programming environments: environmentality and citizen sensing in the smart city’ that any sort of data driven environment, in the case of AV’s programmed for use by geo-localisation, corporations and governments, ‘raises questions as to how these orchestrated ways of life would be actually lived, thereby rerouting programs of efficiency and productivity’ (Garby, 38). 11 AV’s run the risk, of not only remapping our societies role of public transport, but remapping our urban landscapes, putting emphasis on certain areas over others due to capacity and data. Garby states that in this sort of world ‘the actions of citizens have less to do with individuals exercising rights and responsibilities, and more to do with operationalising the cybernetic functions of the smart city.’ 12 By removing as much responsibility of choice for passengers, we run the risk of editing our natural everyday space as we have to come to do with our digital space. Helen Ghiradella writes in ‘Where Will Driverless Cars Take Us?’ that ‘more and more of our daily experience is secondhand – gathered, edited, and placed by someone else. With such increasingly artificial and thus constrained experience, who will see the surprising new thing, either indoors or out, that may refresh the thinking of his or her generation?’ (Ghiradella, 435). 13 This prediction may be right, and as people we may be taking our hands off the wheel of society to soon, and allowing autonomous technology, to steer us in the wrong direction. 1 Musk, Elon. TED Talks “The future we’re building — and boring with Elon Musk” 39:30 – 39:45 TED.com TED 2017, April 2017, https://www.ted.com/talks/elon_musk_the_future_we_re_building_and_boring Accessed 23.09.18. Catch.” The Atlantic, Atlantic Media Company, 22 Dec. 2017, www.theatlantic.com/technology/ archive/2017/12/self-driving-cars-free-future/548945/ . Accessed 23.09.18. 5 Road Safety in the European Union: Trends, Statistics and Main Challenges, November 2016. European Commission, 2016. 8 Barreneche, Carlos. “Governing the Geocoded World: Environmentality and the Politics of Location Platforms.” Convergence: The International Journal of Research into New Media Technologies, vol. 18, no. 3, 2012, pp. 332., doi:10.1177/1354856512442764. « Mission Control: The changing boundaries of control and ownership in the world’s biggest crowd funding success.